If I could I would let trouble slide right on by me. I’d rather not wrestle under its weight as it threatens to scatter my hope and strength in millions of little pieces. The darkness that shrouds my mind when trouble lingers too long leaves me questioning what do I truly believe. But it is through trouble that the source of all comfort can be seen. Do we miss him when our only aim is to be free of what bothers us? 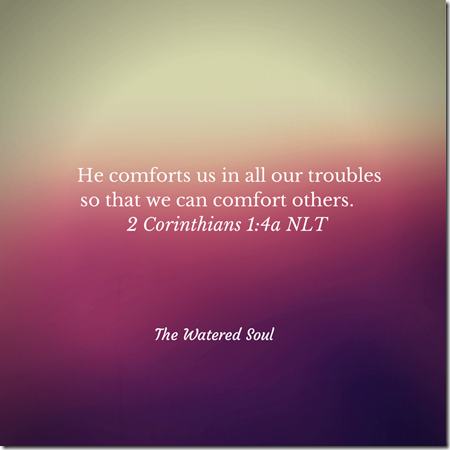 Why does the Comforter show up in our troubles? Well it is not just about you. He equips us with something of worth to offer others during their times of trouble. 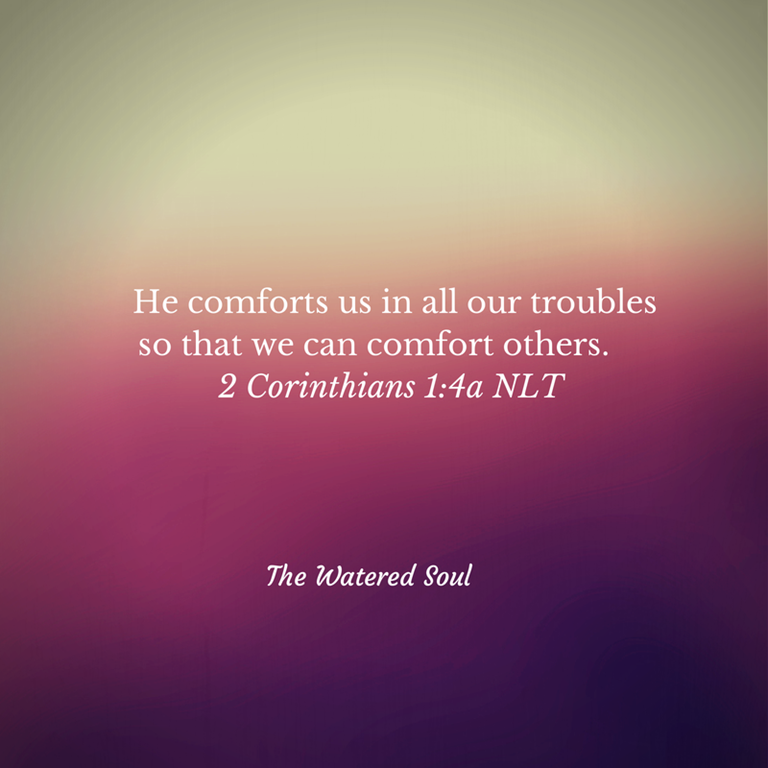 When they are troubled, we will be able to give them the same comfort God has given us. When I came across the scripture, I kept rereading it because too often I feel ill-equipped when I come across those facing trouble. 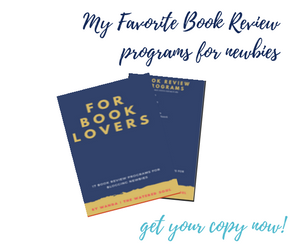 Words I might offer feel inadequate and I sure do not want to be guilty of giving people well-meaning but rote psychobabble that does nothing to help provide solace. In all our trouble God comforts. We do not come out of our troubles empty but we have something to give to one others. Look around you is there someone who needs comforting in your sphere of influence? We don’t have to travel to far away lands to see those in need of comfort but wherever he calls us may we have eyes to see and the willingness to use what has been given to us. If I can avoid trouble, I will. But, I am learning to go into the whirlwind, full-force, knowing that He is holding my hand, no matter the outcome. I know that nothing can separate me from God in life or death and I have to keep telling myself this, in the midst of all trouble( Romans 8: 38) And, when I see others in the whirlwind, I pray for them and extend my hand, whether that be by a smile, pat on the back or lending an ear—just letting them know that I am available. When I extend my hand, I ask the Lord to take over because I do not have the words and power that others need, but I know He does. I love the Corinthians Scripture you used for this entry. Joy to you! Very wise words Cynthia. That’s the important thing to keep in mind that it’s not us has the solutions to any one problems. When we can trust that God has the answer and do as he leads us, we take the pressure off ourselves. I agree with both you and Cynthia, Wanda. As I get older I often find that past troubles have prepared me to offer a word of encouragement to someone else going through a rough patch. It seems to so simple to say, “God is with you,” but in all truth, He is! And that makes all the difference. It is simple yet oh so profound. Even when we can’t see or sense Him, he is there nevertheless. Wanda, as I am walking through my own season of troubles of late, this really ministers to me. Thank you! You will have more to pour out to others Barbie. May the comfort of the Father be with you during as you walk through this season. This is so timely, Wanda. I went to yet another funeral recently, and I was pretty sure I was not going to be able to function after it. BUT my comfort came from the most unexpected source, my little 4-month-old cousin. Her mom gave her to me at the wake and she just calmly stuck to me like glue. She was this calm happy presence in a tiny package when I was ready to fall flat on my face. When I posted a picture of her on my Instagram, everyone was commenting on how cute she looked, but I don’t think they realize that she probably saved my sanity … my life … with comfort, and here main communication was by babbling to me in baby talk all night. I’ve never been so happy to have someone “babble” to me in all my life. Ahh, that is such a beautiful demonstration of God providing comfort. Who would have ever thought to look for it a little baby who had no coherent words to express? Hi Wanda! I know that I have been through a lot of rough weather, and I am only seeing now how I can help my friends with theirs. Going through all the turmoil and emotions seems so pointless at the time. But now I can appreciate how I can be a source of ‘You too?’ And that creates and ease and comfort that you just can’t buy. I know you have been a comfort to others Wanda. And that is such a precious gift! Hi Ceil, it’s hard to see the good things that can come out of our bad times when walking through them. But when you come out on the other side there is nothing like that assurance you have it’s possible to survive it with God’s help. No, we don’t have to travel far… just look to our own families or even next door. If each of us shared our experience of God’s sustaining power, wouldn’t that work miracles! I wrote this the other – isn’t it interesting how He speaks the something into the hearts of those He calls precious. Jesus faced trouble with the evil one. Faced trouble at the death of Lazarus. Faced trouble at the Sea of Galilee. Trouble surrounded the Cross of Christ. But God’s shadow is longer still. Trouble is a tool in His hand. It removes the hard places. It teaches us to lean into Him. Trouble keeps us from trusting ourselves. Hi Chris, it’s so interesting to see the unique expression of God’s love, comfort and guidance to each of us. Yet there is a unity of message. I really like these lines trouble’s shadow may be long, but God’s shadow is longer still! So beautiful sweet sister! Oh Wanda, I do love that verse. Trouble can be unavoidable sometimes. Many times our Lord uses this to help us grow in such amazing ways, and then use this to help others – just as you said. This is so rewarding to be a servant of The Lord. Stopping by from The Weekend Brew. So glad you blessed my Saturday. God knows just what to include in our grow up plan to get us to greater level of maturity for sure Kim. Although we don’t often see it when we walking through it at time but our testimony blesses one another. Hope you have a wonderful holiday weekend Kim!